All you need to expand your Signing Smart workshop programming and reach families of children 18-months through 5 years. 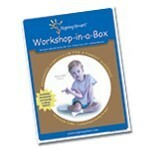 This 3-hour workshop is perfect both for families already using Signing Smart, AS WELL AS those new to the program. With strategies and techniques available no where else, you will be able to teach your audience how to be Signing Smart with older toddlers and preschoolers--helping children understand nuances of spoken English, promoting early literacy, aiding in discipline, fostering self esteem and emotional development, and supporting children?s concept formation, reasoning / problem solving skills, and inference-making abilities. The Curriculum is developed to be easily tailored to a toddler-only, preschooler-only, or mixed age audience. Includes comprehensive notes, adult group activities, numerous example videos of parents and children using strategies to enhance development and foster intimacy, and PowerPoint slides/overheads. Also includes a CD of relevant handouts and documents as well as an instructor DVD Clip Bank of "at home" clips. These clips show families using our sophisticated and yet intuitive Signing Smart strategies that are especially relevant for older toddlers and preschoolers. The clips also demonstrate how parents and children can continue to benefit from signs past the time when children have transitioned to using words as their primary mode of communication. All Signing Smart Instructors benefit from a wealth of other business and program support. Click here to find out more about the support and resources available for Signing Smart Instructors. Please Contact Us for information on becoming a Signing Smart Instructor and to purchase the Advanced Workshop-in-a-Box for a Parent Audience.